Final Fantasy XIV doesn’t only feature a diverse list of races to choose from but also a various group of tribes within those races. Midlanders – a Hyur tribe dominant among the race. Their tribe is very well educated having grown up around books, its people have a thick layer of knowledge. Highlanders – a mercenary-type Hyur tribe, its members large and built. After the fall of their city-state Aramigo, sightings of tribe members have become rare. Seekers of the Sun – a Miqo’te tribe of sun-god worshipers. Their eyes are strikingly light and most of their activity is done during the day. Keepers of the Moon – a Miqo’te tribe of moon-god worshipers. They decorate their bodies in war-paint and most of their activity is done during the night. the field and have particularly good hearing. 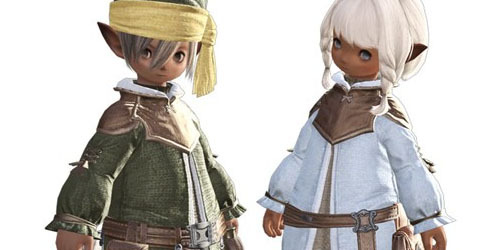 Dunesfolk – a nomadic herding Lalafell tribe living in the sandy deserts of Eorzea. They usually can be seen with a jewel fixed right in between their eyebrows. Forester – an Elezen tribe who, hundreds of years ago, were living deep in the forest. They’re a sharp-eyed group excelling in archery. Today they’ve taken the nomadic route and adapt to the city and plains in which they stop. Shaders – an Elezen tribe who, hundreds of years ago, were based in dark limestone caves. Thanks to this, they’ve developed bat-like ears with an amazing sense of hearing and are naturally skilled in the fighting arts. Seewolf – also known as the “wolves of the sea”, this is a Roegadyn tribe who work as seamen and sailors. Lohengarde – the “gentlemen of fire”, this is a Roegadyn group known for their training of fire-spells. Their skin appears dark red. Check out models of the various tribes (all named under their image) at the gallery.